Thrilled to have worked with Solomon's Mountain Miracle on a special "photo balm" session. Groan, I know, but now we have balm and they took a nice set of press photos for us. Kaboom - photo balm! Here's a peek at the lovely presentation of some new tins of this magical stuff, now for sale at The Greens' merch table. The Greens' Killer Salve! The Greens have used this salve personally, and it's a pretty amazing thing. It's a true all-purpose product and it's 100% natchy. Pick up some salve next time you're on the dance floor and find yourself... ahem... a little chafed. Oh, the photos! Here's a couple samples of the work Solomon's did for us that day. Truly impressed by how this session turned out. The Greens have been thinking a lot about this great state of West Virginia we call home. So many important and formative things have happened as we’ve played over the years, and every single WV city we’ve played has had a special role in making us who we are today. We played Appalachian Mtn Flame Off for Tom last year at Silver Lake Park in beautiful Eglon WV. This year we return to the park to play Floyd Cowger’s 4/20 Gathering! We are co-headlining this event with known-to-be-badass group Optimus Riff. They’ll hit the stage Saturday while we headline Friday night from 8-10pm. Last time Floyd wanted The Greens to play at his gathering, we were unable. This year we ALMOST were unable but Floyd got us a day/time that jives. Looking forward to being part of this special weekend! 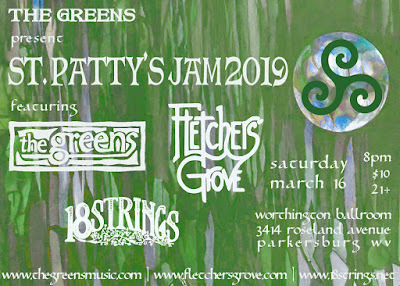 Whether you live in Morgantown area or Parkersburg area, your St. Patrick's Day weekend just got a whole lot greener. Saturday March 16 at the Worthington Ballroom in Parkersburg is going to be our biggest and bestest ballroom lineup ever. I mean ever. We've never had so many great acts on one bill for one night of epic music. Sunday March 17 at 123 Pleasant St in Morgantown - need we say more? It's the official holiday date and it's Morgantown and if you've never seen Golden Horseshoe you gotta come see this act. It's a supergroup comprised of several members from many area bands and they will knock you out. Come Get Green with The Greens. © 2002-2019 The Greens Music, LLC. Powered by Blogger.